(Vancouver, BC – March 2nd, 2016) – Yesterday’s finale to the 8th Annual Chinese Restaurant Awards (CRA) marked another year of outstanding Chinese culinary achievement that included a first-of-its-kind East Meets West gala dinner with Michelin-starred chefs, Diners’ Choice Awards, Social Media Choice Awards and the much-coveted Critics’ Choice Signature Dish Awards. 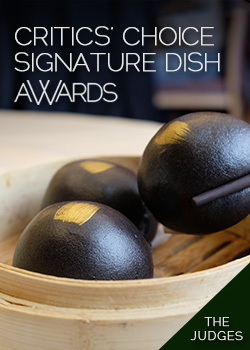 The Awards Ceremony, held at the River Rock Show Theatre, and recognizing the winners of the Critics’ Choice Signature Dish Awards and Social Media Choice Awards, was the culmination of a year-long process of defining and celebrating the ‘Best in Chinese Cuisine’ in Metro Vancouver. The Diners’ Choice Awards, which received more than 34,000 votes cast by eager diners, were announced this past February. All Awards’ tabulations were audited by Mrs. Jacqueline Lai, CPA. For the eighth year, four fearless critics selflessly gave up their evenings and weekends to dine out at Chinese restaurants across Metro to determine the best Signature Dishes. The Awards Panel this year included: Stephen Wong (cofounder of CRA, respected Chef and recognized Chinese food authority), Lee Man (food writer – Vancouver Magazine, Wine Access, Northwest Best Places, Time Out and Eat Magazine), Brendan Mathews (former restaurant critic Richmond Review, contributor to Vancouver Magazine) and Foodie Yau (a travel writer and anonymous restaurant reviewer who writes for various publications including Gourmet Vancouver). The task was a daunting one as each year these experienced and sophisticated palates have to determine if a new restaurant or dish is ‘award-worthy,’ or if a past award-winner has perhaps slipped. It’s a tough job entailing many tasting hours followed by intense discussion and notes comparison. You’ll see some surprises and new names amongst this year’s winners reflecting the dynamic nature of Metro’s Chinese culinary scene. A new component, from the 2015 awards, was the recognition of the powerful role played by social media in reflecting, and to some degree determining, the tastes of local diners. CRA carefully researched the saturated social food media field and selected four individuals who had demonstrated exceptional knowledge of Chinese cuisine and its regional expressions as well as being acknowledged by their peers as among the best. These social media judges played a vital role in inspiring the dining public to approach restaurants and iconic dishes with a more critical eye. Through posting about their tasting journey on their social media networks, the four judges engaged the public in lively discussions about dishes and restaurants – adding to the collective knowledge about each. The inaugural social media judges of the 2016 awards are: Sherman Chan, Emily Cheng, Jesse Tsao, and Cathy Zhou. This year marked a milestone for the CRA. As part of the celebration of its 8th year, the CRA produced with Shangri-La Hotel, Vancouver, the East Meets West, a pair of exclusive dinners held this past January at Market by Jean-Georges in the Hotel. Michelin-starred Chefs Samuel Lee Sum and Christophe Moret from the Shangri-La Hotel, Paris were joined by Market’s own chef, Ken Nakano and international award-winning pastry chef Thomas Haas, to create an eight-course, cross culinary-culture dinner. Each year CRA recognizes a Canadian food product-of-excellence that has been incorporated into Chinese cuisine. This year’s winner is B.C. Geoduck by Underwater Harvesters’ Association. BC Geoduck has earned an international reputation for its great flavor. The Underwater Harvesters’ have worked tirelessly to promote B.C. 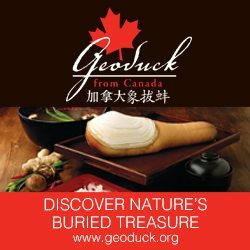 as the globe’s leading supplier of quality geoducks. In 2014, CRA established a scholarship fund at Vancouver Community College to support students in financial need to attend the College’s Asian Culinary Arts Department. To date three students have attended with aid from CRA. We are pleased to announce that this year we are partnering with BC Hospitality Foundation to ensure funding through spring 2018. The Chinese Restaurant Awards have much to celebrate in its auspicious eighth year. The Chinese culinary scene in Vancouver continues to evolve, developing a reputation as one of the best places in the world for Chinese cuisine outside of China. Chinese cuisine is influencing chefs of other cultures, ways of cooking and flavour profiles across the Lower Mainland. Young people interested in a culinary career are taking their certificate at VCC’s Asian culinary program. All of this has either come about, or increased, in the eight years since the Awards’ inception. Parker Place (Aberdeen) Meat & B.B.Q. The Chinese Restaurant Awards wishes to thank the following sponsors: Alberta Canola Producers Commission, River Rock Casino Resort, Hennessy, Rémy Martin, Heineken, Mission Hill Winery, Underwater Harvesters Association, Bites of Vancouver and our partners.